On the third day there was a wedding in Cana in Galilee (John 2:1-11). 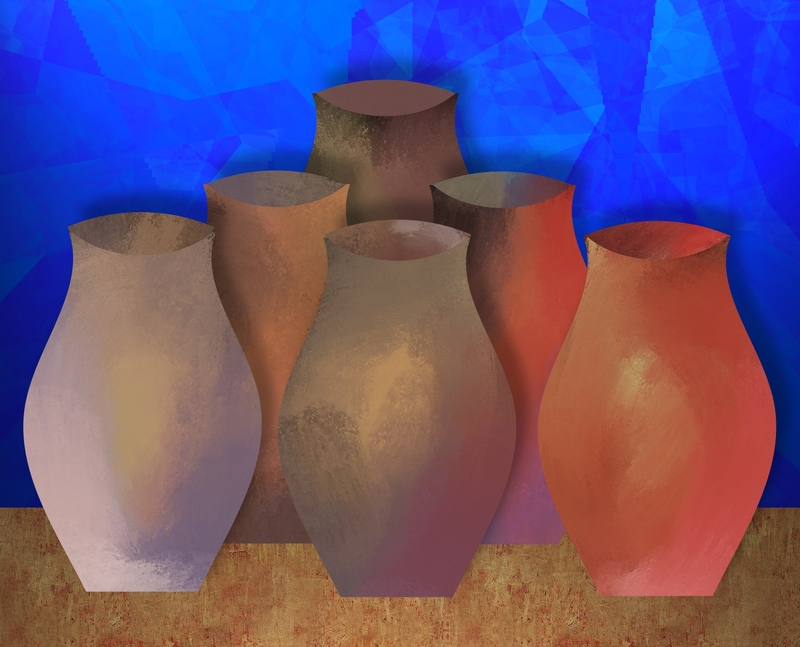 Six stone jars: fairly large; impervious to contamination; necessary equipment, if people were to maintain the tradition of the elders and practice their faith, if they were to keep their relationship with God alive and healthy; so familiar, people hardly thought much about them; dependably there for the time when they would be needed. Six stone jars, empty and waiting for the right moment. And he said, “Fill the jars with water.” Ordinary water drawn from the well at the village center; the same well where everyone else got their water: water that cooked food and quenched thirst, that washed clothes and bodies, that soothed fevered foreheads and cleaned newborn babies and prepared the dead for burial. And the water came, not easily as from a kitchen spigot, but bucket by bucket, carried by ordinary household servants. And they filled those jars to the brim. Six stone jars, now filled with water and waiting. The stage is set, and oh-so-quietly the moment has come. And then in the space between a period and the beginning of a new verse, as the story is written – in the space of half a breath as it was played out that day – the water became wine. No incense or incantation; no holocaust or atmospherics; only a ripe, pregnant moment when disappointment that the party seemed ready to end too early was met by the presence of Christ, and the water became wine. No ordinary wine, mind you, but the best wine, wine that if anyone had thought about it would have conjured up Isaiah’s vision of the feast of heaven, “a feast of well-aged wines, of rich food filled with marrow, of well-aged wines strained clear” (Isa. 25:6). Six stone jars full of water at the right time, now filled with the vintage of heaven itself. And the kingdom of God had come upon them, the reign of God had begun. Not everyone saw it, of course. Most, if they said anything at all, said simply, “This is good wine!” Then they went on with the party, went on with their ordinary lives, back to their ordinary household chores and ordinary jobs and ordinary relationships. And what most of them tasted that day soon became merely a story they might have told when the pictures were passed around at the anniversary dinner, and then became hardly remembered at all. But some saw. His disciples, those who followed him most closely and shared his life most intimately, saw and believed in him. The promise of life that first called them to this wandering rabbi became real for them. The new Jerusalem, the one that was to come one day on the clouds, was suddenly all around them. They walked its streets; they were dazzled by its splendor; they drank its new wine. They tasted the truth Saint Paul would later set down in words, that “If anyone is in Christ, there is a new creation: everything old has passed away; see, everything has become new” (2 Cor. 5:17 NRSV)! Because of six stone jars; because of nearly 200 gallons of ordinary water carried from the village well, bucket by bucket, by ordinary household servants. Because in a moment, in the space of half a breath, everything changed. “What I want to talk about now,” Saint Paul wrote, “is the various ways God’s Spirit gets worked into our lives. Each person is given something to do that shows who God is [so that] everyone benefits” (1 Cor. 12:1, 7 The Message). Paul names some of God’s gifts: wise counsel; clear understanding; simple trust; healing; miraculous acts; proclamation; distinguishing between spirits; tongues and their interpretation. Extraordinary gifts, large buckets of gifts, gifts that hold lots of the water. Other gifts, he doesn’t mention. The ability to sew, for example: remember Dorcas, who made clothes for the poor (Acts 9:36-42). The gift of hospitality: remember Prisca and Aquila, who held meetings for prayer and worship in their house (1 Cor. 16:19). The gift of companionship: remember Stephanas and Fortunatus, who came to Paul and refreshed his spirit (1 Cor. 16:17-18). There was the gift of secretarial ability: remember Tertius, Paul’s stenographer (Rom. 16:22). The gift of financial management: remember Erastus, the city treasurer (Rom. 16:23). The gift of nurturing relationships through the sharing of news: remember Tychicus, who carried news of Paul to the church in Colossae (Col. 4:7). Everyday gifts, cups that hold just enough water to do what needs doing. Now consider us gathered here, ordinary servants in the household of faith. Some of us come with great buckets of gifts; others with small cups; some with gifts poured out drop by drop in the hope we share with one another and the tears we shed for one another; but all of us with something. Different as we are, we bring our gifts to fill the old stone jar of this church for the common good, for the creation of the authentic human community that is the kingdom of God, knowing that without the gift any one of us brings, our offering is incomplete, the jar still empty, and awaiting the moment when Christ will transform what we bring into the well-aged wines of the feast of heaven.